So you have been looking for a new water flosser for quite a while now and have narrowed your search down to two products. It’s a toss-up (or a floss-up, if you like): the Waterpik Aquarius vs Ultra, 2 of our top rated products on our list, which you can find here. It seems like a pretty straightforward decision on the face of it, but it’s not always easy to make up your mind. Well, here are 15 or so comparisons between the Ultra and Aquarius to give you a better idea of how they function and to maybe help you to get the bit between your teeth and finally decide which water flosser will help you to avoid unnecessary trips to the dentist. Oral hygiene is something no one should neglect as it can not only lead to dental problems, but it can also have a negative impact on your overall health. The good news is you can take better care of your teeth yourself with the various products out there. If you want to reduce plaque, gingivitis and gum disease then water flossers are pretty much the standard items on the market these days. If you have braces or implants, and crowns, bridges, and veneers, then again there is no going wrong with a decent water flosser. Water flossers use a pulsating jet of water that pressure sprays between your teeth and below the gum line to remove plaque and food debris. So no more taking out the floss and doing the tedious job. It is very quick and easy to use and dislodges anything stuck between your teeth in the blink of an eye. 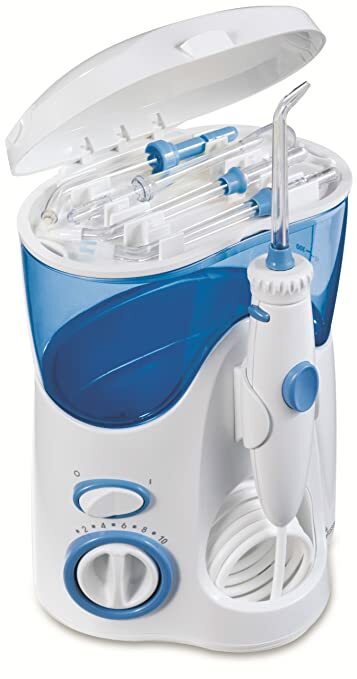 One of the most advanced water flossers out there, the Waterpik Aquarius Water Flosser WP-660 – comes with a water control function on the handle and it is as easy as sliding it on and off. It also has a covered reservoir with a capacity of 90 (in seconds) while there is also a covered tip storage in the unit. One of its cool key features is the new pulse-modulation technology. You get maximum plaque removal with the floss mode and enhanced gum stimulation and improved circulation with the hydro-pulse massage mode by using the one-minute timer with a 30-second pacer. It also has a pretty easy to understand LED information panel, seven water flosser tips while the number of pressure settings goes up to 10. The Waterpik Aquarius has two types of heads – a normal one and a compact one. On the technical side, the cord is 53 inches and the voltage is compatible with 120VAC/60Hz (North America) outlets. It comes standard with a three-year warranty, while white is your only option for a color. 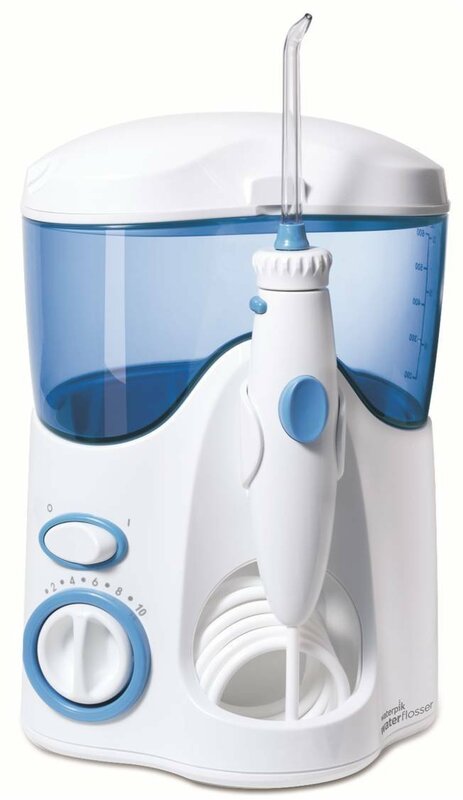 The Waterpik Ultra also features a water control option on the handle with a push button that allows you to easily switch it on or off while there is also a pause button to change tips midway through your floss. The covered reservoir capacity is also 90 (in seconds) and includes a covered tip storage in the unit. Unlike the Waterpik Aquarius, the Ultra does not have an LED information panel, hydro-pulse massage mode or timer. But it does come with six water flosser tips that are color-coded, a Plaque Seeker tip, two traditional Jet tips, a Toothbrush tip, and a Pik Pocket tip among others. It also has an advanced pressure control system with 10 settings, 360-degree tip rotation and is much quieter than other models out there. The power cord length is 54 inches while the voltage is compatible with 120VAC/60Hz (North America) outlets. Black and White are the colors you can choose from while it also has a three-year warranty. The Waterpik Aquarius is the latest product on the market with its key feature the hydro-pulse massage mode, which has a one-minute timer and 30-second pacer, and improves blood flow by massaging the gums. But you also can’t go wrong with the Ultra as it does the flossing job that you are not always keen on doing yourself, especially if you are looking to try out a water flosser for the first time. It is quick and effective and will improve not only your dental hygiene, but overall health.